The representation appears solemn and poetic at the same time, playing on the silent dialogue between the angel and the holy Cecilia, united in a profound and moving gaze. But it is the figure of the angel, the divine messenger, who dominates the scene with his great open wings occupying the entire space of the canvas and chiseled with flashes of light that illuminate the clear, almost silvery plumage. The choice of iconography is connected to the renewed interest in the cult of Saint Cecilia, the ancient Christian martyr whose remains had been found in the church dedicated to her in Trastevere, just in time for the jubilee of 1600. Carlo Saraceni ingeniously staged here a synthesis of the theme of the holiness of the saint and the profaneness of the concert, in vogue in Rome as a result of the inventions of Caravaggio and the love for music of many important patrons of the period. 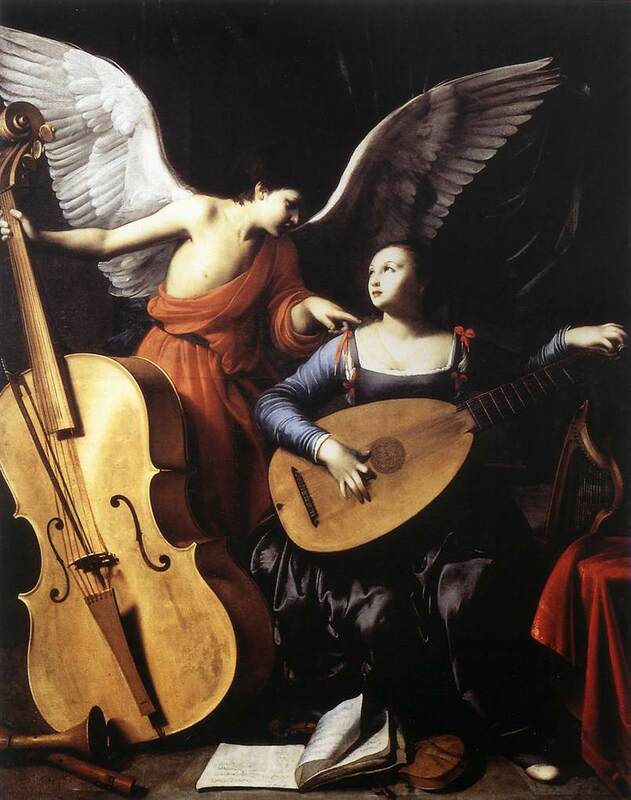 Saraceni’s work is sophisticated and original in its perfectly accurate representation of the easily identifiable musical instruments: the bass held by the angel, closing off the image laterally, and the lute, shawm, recorder, violin, and harp in the background near the red drape. Born in Venice, Saraceni arrived in Rome at the end of the sixteenth century, becoming one of the first followers of Caravaggio but offering a very personal and lyrical interpretation of the more dramatic inventions of the master.